And, just for the record, we're putting it out there that we have this everything-but-the-kitchen-sink edition of Mr. Anderson's soon-not-to-be-latest film available for anyone who would like it to grace their physical and/or virtual homes. 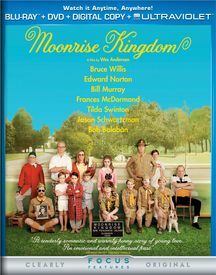 Includes bonus features, "A Look Inside Moonrise Kingdom," "Welcome to the Island of New Penzance" and "Set Tour with Bill Murray." Moonrise Kingdom presents a (very retro) take on an all-American adolescence in all its glory, as only Wes Anderson can.